Low fluid almost always indicates a leak or a malfunction in the transmission or its related components. You should be aware of changes in the driving characteristics of your vehicle – late or early shifting, slipping or unusual noise of any kind. Excessive heat is a major cause of premature transmission failure and the reason why many cars end up in a transmission repair shop. Transmission service is also recommended after rocking the vehicle back and forth when stuck in snow or sand. This is due to the transmission operating in excess of 400 degrees. Heavy loads will cause overheating and reduce transmission life as well. You should use caution not to exceed the vehicle manufacturers weight limits. Invariably, one of the preceding scenarios occurs and auto transmission service is needed. 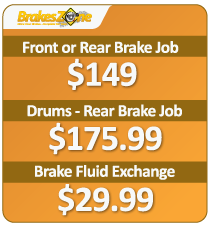 From automatic transmission flush service to fixing rough shifting problems, BrakesZone is the trusted transmission repair shop that provides reliable, affordable automatic and manual transmission service. Here’s a rundown of the car transmission services we provide. Looking to save money on transmission service? 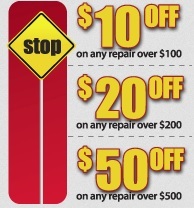 Check out our transmission service coupon for the latest deals and specials. To save even more on transmission service cost, check out our great coupons. Additional charges may apply to cost of service based on vehicle and/or services required.